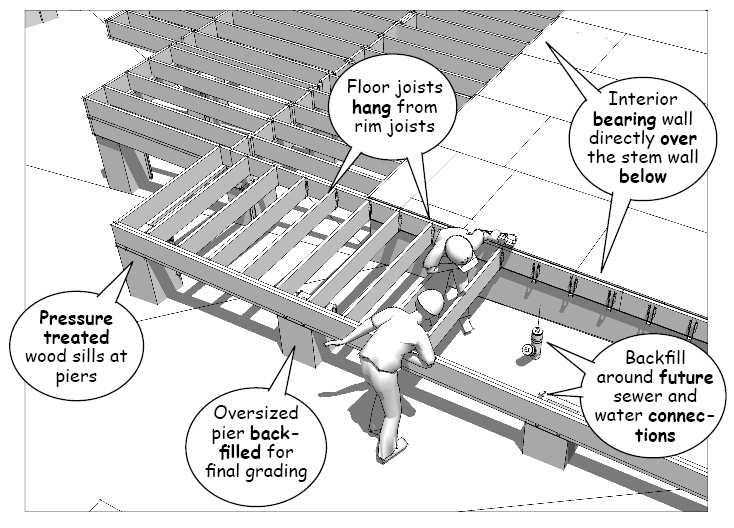 For jobsite safety, professional framers will install the plywood subfloor as soon as the joists have been secured. In high wind or earthquake zones, the joists and floor frame are strapped to the foundation at the ends of the girders and along the perimeter. The subfloor is laid in a staggered pattern so that its lengths are perpendicular to the direction of the joists. The plywood is then glued and nailed to the joists so the seams are centered on the length of the bearing surface. In some cases, interlocking panels and/or edge nailing to solid blocking are used to add strength to the floor framing. Solid blocking under bearing loads from above are also important. 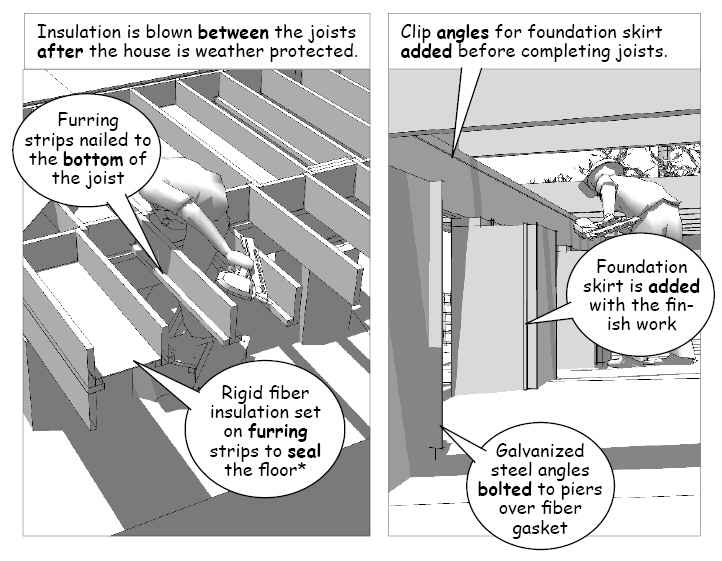 In this example an opening is framed in the floor joists to provide access to the crawlspace. 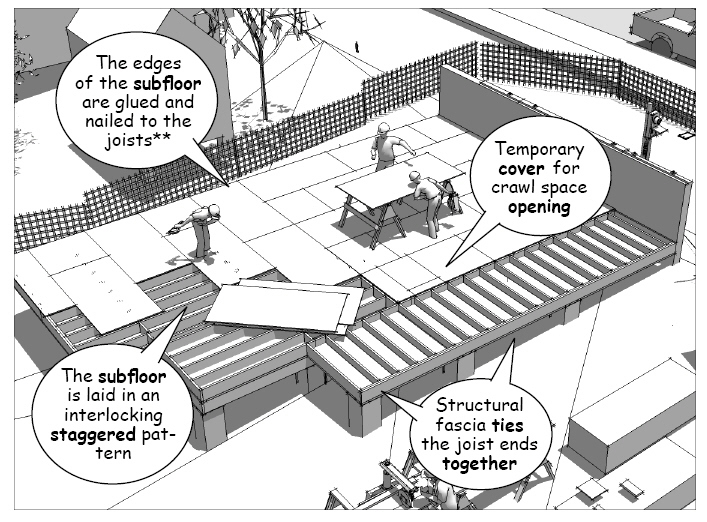 Interior access is important when you want to avoid frost lines or swales in the finish grade around the building. The enclosed crawl space is also prepared for future construction before the floor is sealed. This includes raking out rocks and debris and spreading sand or heavy mats to make it easier to service certain areas. Materials and equipment that would be difficult or impossible to put in the crawlspace are also staged for later installations. The open crawlspace is framed over girders and foundation piers. The frame is again strapped to the foundation to structurally tie the frame to the foundation. 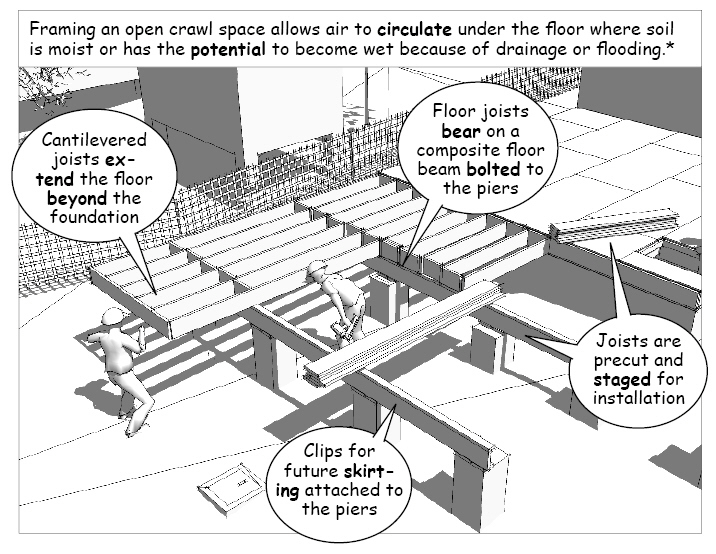 Open crawl spaces allow drainage, shade, and natural circulation in warm, humid, or wet environments, but require insulation and soffits in cold climates. Access under the raised floor makes it easier to maintain or change mechanical and electrical systems, but it’s important to use pressure treated materials in extremely moist areas or if the joists are less than 18 inches from the finish grade. The crawl space is again prepared for future construction. This includes installing plumbing and mechanical systems under the floor and grading the backfill to slope away from the foundation piers and stem walls. Mechanical and electrical lines are drilled and fitted in the floor cavities before the subfloor is finalized. 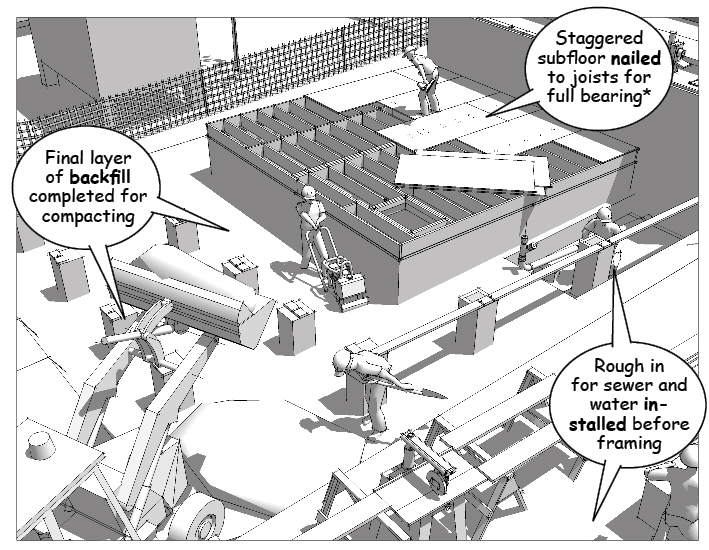 Here again phased construction models and careful planning help coordinate future installations, reduce costs, and speed the final construction. Once the joists are installed, insulation and soffits are fitted to the underside of the open framing. This reduces heating or cooling losses through the floor and seals the joists and insulation from moisture, insects, and other pests. Perimeter skirting prevents wild life from using the space for nests or burrows. Note that nail size and nail spacing vary with the loads imposed on the floor and the structural design of the building framework. 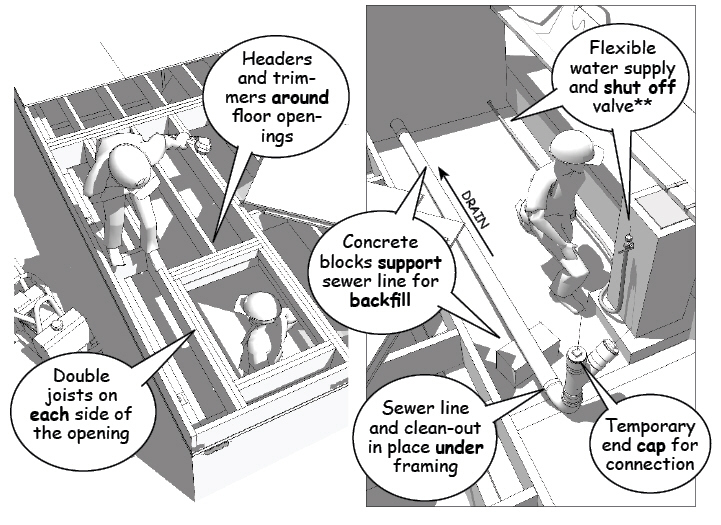 Requirements will vary according to local codes and the loads imposed on the finished frame.